Day Job - I am a Full time Genetic Genealogist doing mainly personalised Irish, Scottish, and English Y-DNA Case Study Reports for my customers! 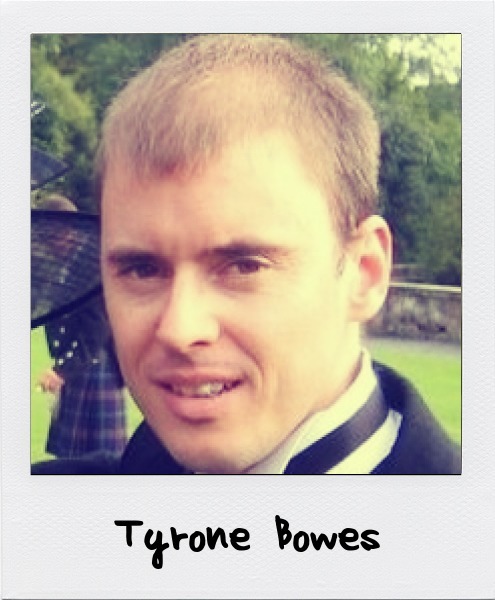 I am Dr Tyrone Bowes and I am originally from Dublin City. I am an experienced Biotechnologist with a 1st Class honours Degree in Biotechnology and a Ph.D. in Neuroimmunology. Prior to founding my own business (Irish Origenes) in July 2011, I had worked extensively as a Scientist in both Academia and Industry. Since 2011, I have also founded the Scottish and English Origenes websites and hope to launch a Welsh Origenes website later this year. I am a member of ISOGG and have given numerous presentations on pinpointing ones origins using commercial DNA testing. I have always been interested in ancestry and in particular surnames. Growing up in Ballymun with my ‘Bowes’ surname (which has a distinctly English sound to it) I was deeply curious to know how my ‘Bowes’ ancestors arrived in Ireland. I wanted to know whether I was descended from 11th Century Norman or 16th Century Elizabethan settlers in Ireland. However this question could not be answered by exploring my ancestral paper-trail. As a scientist when I first heard about commercial ancestral DNA testing I was curious to know what it could reveal about my ancestors. I tested in 2004 but it was not until 2010 with the release of the 1911 census of Ireland that I discovered that the DNA results clearly demonstrated that my ancestors were actually Gaelic Irish from County Laois and that my English-Bowes surname is simply an anglicised version of Gaelic Irish O’Boy. I realised that the surnames of the people with whom I shared a common male ancestor, as revealed by the Y-DNA test results, were all associated with County Laois and had arose among related males living in Laois over 1000 years ago. Subsequent DNA testing of people called Bowe in County Laois conclusively confirmed my Gaelic Irish Roots! Historical and placename evidence demonstrate my long ancestral link with Laois. I realised I could interpret other people’s DNA results and so my new career as a Genetic Genealogist began. In 2010 I began working on the Irish Origenes surnames of Ireland and castles of Ireland databases, and on producing the Irish Origenes Clan territories, Castles, and Clans of Ireland Maps, in addition to an interactive castles of Ireland map, all tools which one can use to pinpoint one’s own Irish origin based on one’s DNA results. Irish Origenes was launched in 2011, followed in 2012 by Scottish, and English Origenes. I also began giving talks on Genetic Genealogy starting at Family Tree DNAs 2012 conference. Since July 2012 I have been doing personalised Case Study reports. In my talk I will demonstrate how the surnames of the people with whom you share a common male ancestor as revealed by the Y-DNA test (which explores the direct male line) can be used to pinpoint to within a single townland where ones direct male ancestor lived when he first picked his surname approximately 1000 years ago. I will detail how this test can determine whether your paternal ancestors were of native Gael, Viking, Norman, Scots-Gallowglass, or later Plantation Scot (or English) origin. I will show practical examples including my own Bowes Y-DNA results which demonstrate my Leinster roots, and a Mr McClelland’s DNA results which places his Scots-Irish ancestry back to the Inishowen peninsula in Ulster in the 10th Century AD. I will also detail the results of the Durkin and Hart Case Studies which lead back to specific townlands in Connaught and Munster respectively. Bowes, McClelland, Durkin, Hart ... and many other surnames to which they are directly-related. When Tyrone set up irishorigenes.com, he had no idea how much in demand he would be. Here Tyrone describes the methodology behind his use of your Y-DNA to help pinpoint the precise location in Ireland where your direct male line ancestors may have came from. Using case studies as examples, Tyrone paints a vivid picture of the potential behind this technique. You can watch a video of the 2014 presentation by simply clicking on the image below. To watch it in Full Screen, click on the "square" icon in the bottom right of the screen.